Truvison unveiled its newest 40-inch smart TV, featuring Full HD display paired with high-performance engine & high-speed response, bringing versatility to your experience. Crafted with slim bezel that captivates its viewers while adding a charm to your room décor, Truvison adds soul to your décor. Sporting a Full HD Display resolution of 1920 X 1080 pixels, the smart TV renders true-to-life HD images that exalt your viewing experience immersing you in a world of endless entertainment. Watch movies, Full HD content at the highest level of details with a dynamic contrast ratio of 300000:1 that produces brightest and the darkest colours efficiently. With Vivid details, bright colours & dynamic visuals redefine every picture, with Truvison you aren’t just watching a movie, you’ll be a part of it. Complementing the superior picture quality is the surround sound system, integrated within the TV that delivers a surpassing audio output making your pictures come alive. Aimed at providing a seamless experience, the smart TV runs on Android and comes with pre-installed applications to let you do more. With this revolutionizing technology, Mobile phones & Laptops with the Miracast feature can be seamlessly connected & we can have all our media in one place. Sharing movies through Miracast is made easy without the hassle of connecting wires. So enjoy connect and share feature with Miracast on your LED Tvs. 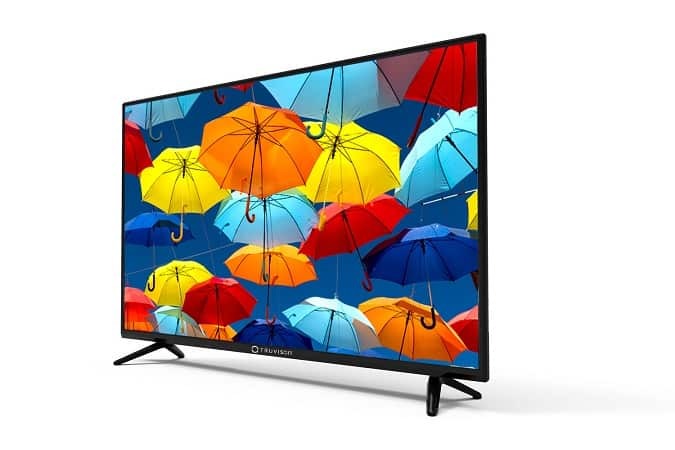 The TV also enables you to plug in your gaming console or use the TV as your computer monitor, with 2 x HDMI ports that give you seamless connectivity The Smart TV also has 2 x USB ports to allow you stream movies and music from your Pen drive or HDD conveniently. In the endeavour to better future, the TV is designed to be energy efficient, which will not only help you to contribute to the environment by conserving energy but also help you save on your monthly electricity bills. This LED TV is already available in leading retail stores across India.